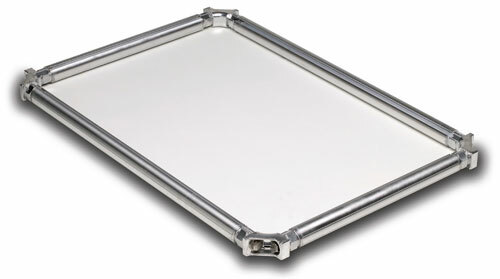 Diamond Chase / Eino Products team has re-designed the Roller Chase Screen Printing frame as the RcX for 2006. This high quality roller frame features an all metal construction with stronger components compared to past roller frames. Our Top Loading double rod locking system captures the fabric quickly and consistently with the use of a wheel type insertion tool. Other features include molded internal threads sealed within the polished endlug preventing the possibility of water retention within the roller caused by the hardware. NO O-Ring Required. The corners strength and appearance have been improved with a high quality aluminum die cast and a secondary polishing process. Improved strength and appearance again make the Roller Chase frame the best frame in the industry. The RcX comes in three different models based on the roller diameter for the various frame sizes and tensioning requirements. Two models are available with one side a square tube. The RcX 1.4 is approximately 1 7/16″ in diameter and is primarily used for manual textile and small format printing. Available with a Square Tube for back clamp presses. The RcX 1.6 is 1 5/8″ in diameter and is used for automatic textile printing at high tension levels and general printing applications. Available with a Square Tube for back clamp presses. The RcX 2.0 is 2″ in diameter and is preferred for oversized textile printing and general printing applications with frames up to 60″. The RCLF large format frames have three models for frames between 5 and 20 feet in length and are still manufactured with the welded end plug and roller support system as before.